The 10 Best Bars in Illinois! Illinois bars are storied institutions, with long-standing roots in the state. Open for decades, these bars have perfected the craft of drink making. Paired with tasty food and the occasional live musical performance, these 10 Illinois bars make for a great night out. The Hideout is an extraordinary bar that embodies the spirit of old Chicago. This historic hot-spot has seen many famous bands and performers since the early 1900s. You never know what’s about to go down at The Hideout. PJ’s Courthouse Tavern in Sycamore is a unique bar in a historic landmark. Built in 1871, the building has been used as a dry goods store, pool hall, and even a public library before becoming a tavern. The original woodwork is still displayed throughout PJ’s Courthouse Tavern. Get the best entertainment in Huntley at Sammy’s Bar & Grill. Besides serving delicious drinks and food, this friendly bar strives to make all guests feel welcome. It’s not the fanciest bar, but it’s got that hometown feel that keeps you coming back. There’s never a dull moment at Emporium Arcade Bar in Chicago. They provide pinball, video games, and table games for hours of friendly competition. Beer, game, and music events are also held at this popular bar on a regular basis, as well. Scofflaw is an urban-rustic bar in Logan Square known for their gin cocktails, American craft beers, and upscale food. It’s a cozy environment perfect for relaxing after a long day. They also give out free, freshly-baked cookies at midnight. With all their specials, you’ll want to stop by the Iron Horse Bar & Grill every day of the week. They offer food and drink specials each day of the week, plus fun events throughout the week. Don’t miss Tuesday night trivia or Thursday karaoke at the Iron Horse. This family-owned and operated bar is one of the oldest in Chicago. Here you can catch a White Sox game, much on some crunchy hash browns, or enjoy a cold beer. It’s a traditional dive bar in the Bridgeport neighborhood worth checking out. Hopleaf is a Belgian-inspired adult-only venue serving up famous mussels and frites in addition to a large alcohol selection. Lots of events are held here in a regular basis, making this bar a local hotspot. Hopleaf has been in business for over 25 years. For an award-winning martini bar, head over to The Vine. They are known for their piano bar, beer garden, appetizers, and live music. 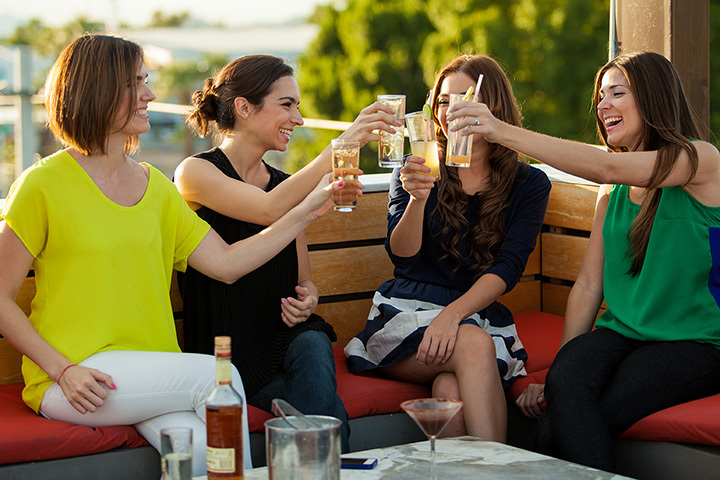 The Vine’s warm and inviting environment and drink specials make it a popular destination for girl’s nights out and even bachelor or bachelorette parties. Tasty burgers and over 100 craft beers? Yes, high quality burgers and craft beers can exist together at the Burger Bar in Chicago. They also have brewmaster tastings, outdoor barbeques, and beer dinners. View more Illinois Bars and Saloons.